The New Generation 3SB intermediate flute by Gemeinhardt. Your hard work and perseverance have brought you to your next level of excellence. When you play on the New Generation 3SB you will know it and feel it! 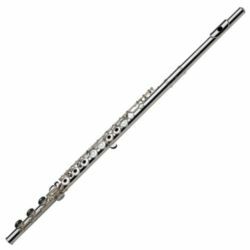 This Gemeinhardt flute has:	New French open-hole key construction for ease of finger placement. New hidden under adjusting screws. Felt in place of cork for contact part of key arms. New shaped-lip solid silver "NG1" head joint. New stylish case and cover with shoulder strap.